The McDermitt mine includes the older Cordero mine complex. The Cordero mines and McDermitt mine are located in the Opalite mercury mining district in the United States of America. The Opalite mercury mining district encompasses locations that are both in the state of northern Nevada and in the state of southern Oregon. The deposits are all related to a large volcanic center (caldera complex) called the McDermitt caldera complex. Mines in the Opalite district include those listed below. The Cordero mine was the first discovery of mercury in the district, quickly followed by the Bretz and Opalite mines to the north. These were both underground and open cut operations. In the 1970s, mercury was discovered in tuffaceous lake sediments adjacent to and just north of the Cordero mine. This deposit was exploited exclusively by open cut mining. It was named the McDermitt mine, and operated by Placer Amex until acquired by Barrick Gold Corporation. The McDermitt mine was the last operating primary mercury production mine in the USA when it ceased operations in 1990. The patented mining claims of the McDermitt mine were still owned by Barrick Gold as of March 2016, but the mine is closed and there is no mining activity in the district. The following summary prepared by Michael Cox is drawn from the extensive body of references and more than five weeks of detailed field examination of the pit during the period of late-2014 to early-2017. The McDermitt open pit mine was excavated in lacustrine and/or fluvial tuff under a thin mantle of recent (Pleistocene) alluvial gravel. According to Giraud (1986) and McCormack (1986) the tuff was only locally reworked by water prior to consolidation. Fragments are nearly always angular, suggesting the source material was unconsolidated pyroclastic debris rather than eroded consolidated rock layers. The parent rock is pyroclastic, with angular fragments of peralkaline rhyolite that contains alkali feldspar phenocrysts, sometimes several centimeters long or larger. During violent gaseous eruptions, the parent magma was fragmented at the vent, blown upward, and deposited on the surface, including into and over lakes and streams. The resulting pyroclastic ash and debris was laid down on the surface of the land existing at the time and later consolidated into rock. The volcanic rocks vary with depth and age, but the main ash deposit is broadly called McDermitt Tuff by Henry et al. (2016), and according to them, the main eruption of tuff occurred at 16.35±0.03 Ma. After the main tuff eruption, the volcanic source chamber collapsed to form an oval surface depression called a caldera. The McDermitt caldera measures 25 miles (40 km) north-south by 14 miles (22 km) to 19 miles (30 km) east-west. 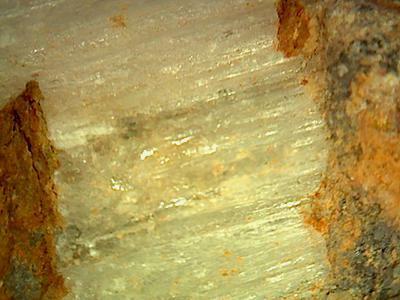 Hydrothermal fluids then deposited the antimony and mercury mineralization and silicified the parent tuff. This occurred at about 15.7±0.4 Ma based on Noble et al. 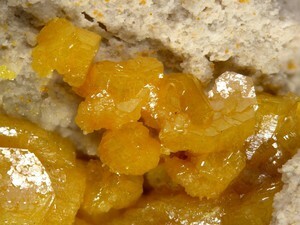 (1988) dating adularia from the open pit ore. Sometimes the silica and ore replacement is so thorough the parent rock textures and grains can no longer be recognized, even in thin sections under the microscope. Reference: NBMG Spec. Pub. 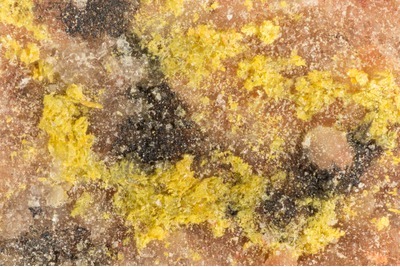 31 Minerals of Nevada; McCormack, J.K. (2000): Mineralium Deposita 35(8), 796-798. 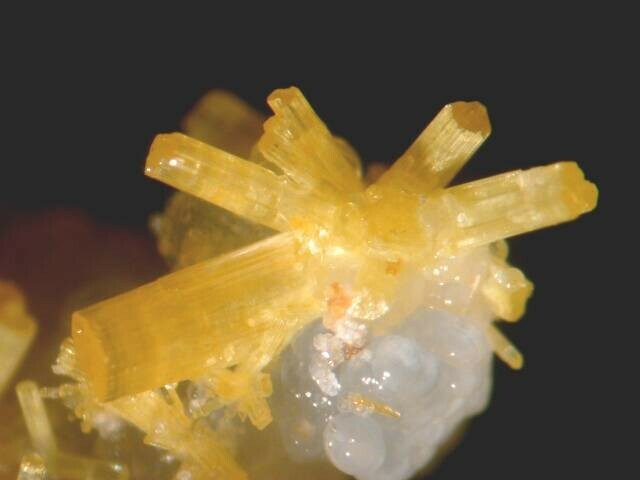 Reference: [AmMin 84:194]; McCormack, J.K. (2000): Mineralium Deposita 35(8), 796-798. Reference: Bull. Soc. Franç. Minéralo. Cristallo. , 1974, 97, p. 501. 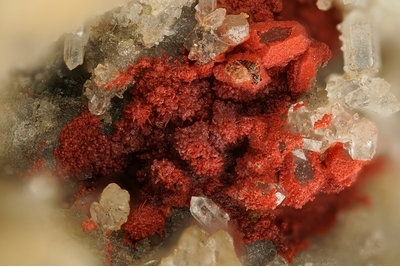 Reference: Rocks & Minerals, Nov. 1999; McCormack, J.K. (2000): Mineralium Deposita 35(8), 796-798. Schuette, C.N. (1938) Quicksilver in Oregon. Oregon Department of Geology and Mineral Industries Bulletin No. 4, 172 pp. Yates, R.G. (1942) Quicksilver deposits of the Opalite district, Malheur County, Oregon and Humboldt County, Nevada. United States Geological Survey Bulletin 931-N, 319-348. Bailey, E.H. and Phoenix, D.A. (1944) Quicksilver deposits in Nevada. University Nevada Bulletin 38, 206 pp. United States Geological Survey (1946) Minerals yearbook 1946, uranium and thorium, Mineral Industry Surveys, Annual Reviews for Minerals Yearbook, 1946, U.S. Government Printing Office, Reston, VA.
Frondel, C. (1956) Mineral composition of gummite. American Mineralogist, 41, 539-568. Bailey, E.H., Hildebrand, F.A., Christ, C.L. and Fayhe, J.J. (1959) Schuetteite, a new supergene mercury mineral. American Mineralogist, 44, 1026-1038. Brooks, H.C. (1959) Quicksilver in Oregon. Oregon Department of Geology and Mineral Industries. Presented at the geology session of the 1959 Pacific Northwest Regional Conference, AIME. Curry, D.L. (1960) The geology of the Cordero quicksilver mine area, Humboldt County, Nevada. M.S. thesis, University of Oregon, Eugene, Oregon, 58 pp. Fisk, Elwin L. (1961) Cinnabar at Cordero, where they find it...how they find it. Mining Engineering, November, 1228-1230. Puff, H. and Kohlschmidt, R. (1962) Quecksilberchalkogenid-halogenide. Naturwissenschaften, 49, 299. Brooks, H.C. (1963) Quicksilver in Oregon. Oregon Department of Geology and Mineral Industries Bulletin B-055, 223 pp. Wilden, Ronald (1964) Geology and Mineral Deposits of Humboldt County, Nevada. Nevada Bureau of Mines and Geology, Bulletin 59, 164 pp., 3 plates. U.S. Bureau of Mines Staff (1965) Mercury potential of the United States. USBM IC 8252, Part 2 of 2, pp. 224-225. Carlson, E.H. (1967) The growth of HgS and Hg3S2Cl2 single crystals by a vapor phase method. 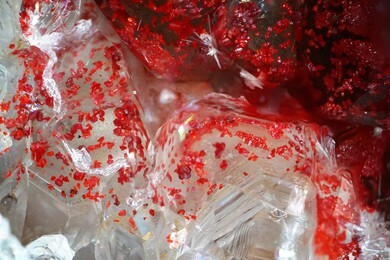 Journal of Crystal Growth, 1, 271-277. Fisk, E.L. (1968) Cordero mine, Opalite mining district. In J.D. Ridge (Ed.) Ore Deposits of the United States, 1933-1967, vol. 2, pp. 1573-1591. AIME Publ. Frueh, A.J. and Gray, N. (1968) Confirmation and refinement of the structure of Hg3S2Cl2. Acta Crystallographica, B24, 156-157. Albers, J. P. and Kleinhampl, F. J. (1970) Spatial relation of mineral deposits to Tertiary volcanic centers in Nevada: U.S. Geol. Survey Prof. Paper 700-C, pp. C1-C10. Greene, R.C. (1972) Preliminary geologic map of the Jordan Meadow quadrangle, Nevada-Oregon. 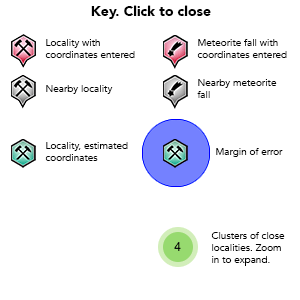 U.S. Geological Survey Misc. Field Studies Map MF-341. Foord, E.E., Berendsen, P., and Storey, L.O. (1974) Corderoite, first natural occurrence of α-Hg3S2Cl2, from the Cordero mercury deposit, Humboldt County, Nevada. American Mineralogist, 59, 652-655. McKee, E.H., Greene, R.C., and Foord, E.E. (1975) Chronology of volcanism, tectonism, and mineralization of the McDermitt caldera, Nevada-Oregon (abs.) Geological Society of America, Abs. with Programs, 1, No. 5, 629-630. Greene, R.C. (1976) Volcanic rocks of the McDermitt caldera, Nevada-Oregon. 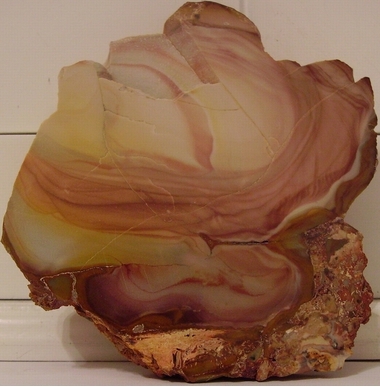 United States Geological Survey Open-File Report 76-753, 80 pp. McKee, E.H. (1976) Origin of the McDermitt caldera in Nevada and Oregon and related mercury deposits. Trans. AIME, 260, 196-199. Roper, M.W. (1976) Hot springs mercury deposition at McDermitt mine, Humboldt County, Nevada. Trans. AIME, 260, 192-195. Rytuba, J.J. (1976) Geology and ore deposits of the McDermitt caldera, Nevada-Oregon. United States Geological Survey Open-File Report 76-535, 9 pp. Speer, W.E. (1977) Geology of the McDermitt mine area, Humboldt County, Nevada. M.S. thesis, University of Arizona, Tucson, Arizona, 65 pp., 2 plates. Rytuba, J.J. and Glanzman, R.K. (1978) Relation of mercury, uranium, and lithium deposits to the McDermitt caldera complex. United States Geological Survey Open-File Report 78-926, 31 pp. Bennet, R.E. (1979, Sept. 6) United States Department of the Interior, Bureau of Land Management, Serial N-20319, Mineral Report, Mineral Patent Application of Placer Amex, Inc. and Sterling Mineral Venture, 24 pp. Glanzman, R.K., McCarthy, J.H., and Rytuba, J.J. (1978) Lithium in the McDermitt Caldera, Nevada and Oregon. Energy, 3(3), 347–353. Glanzman, R.K. and Rytuba, J.J. (1979) Zeolite-clay mineral zonation of volcaniclastic sediments within the McDermitt caldera complex of Nevada and Oregon. United States Geological Survey Open-File Report, 79-1668, 25 pp. Rytuba, J.J., Conrad, W.K., and Glanzman, R.K. (1979) Uranium, thorium, and mercury distribution through the evolution of the McDermitt caldera complex. United States Geological Survey Open-File Report 79-541, 27 pp. Rytuba, J.J. and Glanzman, R.K. (1979) Relation of mercury, uranium, and lithium deposits to the McDermitt caldera complex, Nevada-Oregon. Nevada Bureau of Mines and Geology, Report 33, pp. 109–117. Wallace, A.B., Drexler, J.W., Grant, N.K., and Noble, D.C. (1980) Icelandite and aenigmatite-bearing pantellerite from the McDermitt caldera complex, Nevada-Oregon. Geology, 8, 380–384. Jenkins, R.E. (1981) Minerals of Nevada (Draft # 6). Unpublished manuscript, 280 pp. Roper, M.W. and Wallace, A.B. (1981) Geology of the Aurora uranium prospect, Malheur County, Oregon, in Goodell, P.C. and Waters, A.C. (Eds.) 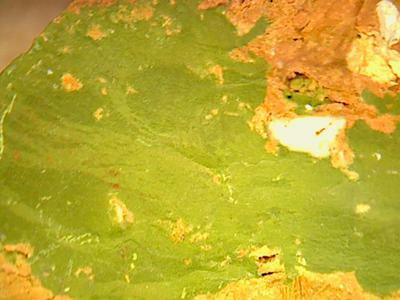 Uranium in Volcanic and Volcaniclastic Rocks. AAPG Studies in Geology, 13, 81–88. Wallace, A.B. and Roper, M.W. (1981) Geology and uranium deposits along the northeastern margin, McDermitt caldera complex, Oregon. AAPG Studies in Geology, 13, 73–79. Castor, S.B., Mitchell, T.P., and Quade, J.G. (1982) National Uranium Resource Evaluation, Vya quadrangle, Nevada, California and Oregon. United States Department of Energy Open-File Report PGJ/F135(82). Garside, L.J., 1982, National Uranium Resource Evaluation, McDermitt Quadrangle, Nevada. U.S. Department of Energy report PGJ/F-045(82), 29 p.
Hetherington, J.J. (1983) The Geology and Mineralization at the McDermitt Mercury Mine, Nevada. M.S. thesis, University of Washington, Seattle, Washington, 54 pages and 14 plates. Rytuba, J.J., Bateson, J.T., Curtis, D.L., Cox, G.A. (1983) Geologic map of the Little Whitehorse Creek quadrangle, Harney and Malheur Counties, Oregon. United States Geological Survey Miscellaneous Field Studies Map 1472, scale 1:24,000. Rytuba, J.J., McKee, E.H. (1984) Peralkaline ash flow tuffs and calderas of the McDermitt volcanic field, southeastern Oregon and north central Nevada. Journal of Geophysical Research, 89, 8616–8628. Farmer, J.R. (1984) Review of National Emission Standards for Mercury. United States EPA Office of Air Quality, Report number EPA-450/3-84-014, 72 pages. Dayvault, R.D., Castor, S.B., Berry, M.R. (1985) Uranium associated with volcanic rocks of the McDermitt Caldera, Nevada and Oregon, in Uranium deposits in volcanic rocks: Proceedings of a technical committee meeting: Panel Proceedings Series-International Atomic Energy Agency, STI/PUB/690, 379-409. Hetherington, J.J., Cheney, E.S. 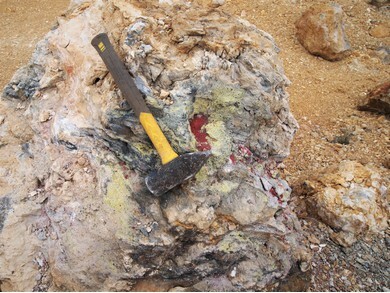 (1985) Origin of the opalite breccia at the McDermitt mercury mine, Nevada. Economic Geology, 80, 1981-1987. Mining Annual Review (1985) Mining Journal, 120. Storey, L.O. (1985) History of the discovery of the McDermitt mine, McDermitt, Nevada. Trans. AIME, 260. Giraud, R.E. (1986) Stratigraphy of Volcanic Sediments in the McDermitt mine, Humboldt County, Nevada. M.S. thesis, University of Idaho Graduate School, Moscow, Idaho, 87 pages and 11 plates. McCormack, J.K. (1986) Paragenesis and origin of sediment-hosted mercury ore at the McDermitt mine, McDermitt, Nevada. M.S. thesis, University of Nevada, Reno, Nevada, 97 pages. Minor, S.A. (1986) Stratigraphy and structure of the western Trout Creek Mountains and northern Bilk Creek Mountains, Harney County, Oregon, and Humboldt County, Nevada. M.S. thesis, University of Colorado, Boulder, 177 pages. Leszcykowski, A.M. (1987) Mineral resources of the Disaster Peak study area, Harney and Malheur Counties, Oregon and Humboldt County, Nevada. United States Bureau of Mines Mineral Land Assessment/1987 Open-File Report 65-87. Schlottmann, J.D. Jr. (1987) Last Mercury Mine Closes. California Mining Journal, April, 17-20. Noble, D.C., McCormack, J.K., McKee, E.H., Silberman, M.L., and Wallace, A.B. (1988) Time of mineralization in the evolution of the McDermitt caldera complex, Nevada-Oregon, and the relation of middle Miocene mineralization in the northern Great Basin to coeval regional basaltic magmatic activity. Economic Geology, 83, 859–863. McCormack, J.K., Dickson, F.W., and Leshendok, M.P. 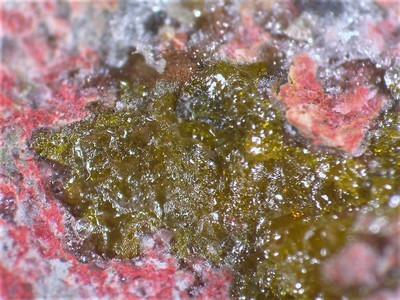 (1991) Radtkeite, Hg3S2Cl(I), a new mineral from the McDermitt mercury deposit, Humboldt County, Nevada. American Mineralogist, 76, 1715-1721. Pierce, K.L., Morgan, L.A. (1992) The track of the Yellowstone hotspot—Volcanism, faulting, and uplift. Geological Society of American Memoir, 179, 1–53. Rytuba, J.J., Heropoulos, C. (1992) Mercury; an important byproduct in epithermal gold systems: In DeYoung, J.H., Jr., Hammarstrom, J.M. (eds.) Contributions to commodity geology research. United States Geological Survey Bulletin 1877, D1-D8. Rytuba, J.J. (1994) Evolution of volcanic and tectonic features in caldera settings and their importance in the localization of ore deposits. Economic Geology, 89, 1687–1696. Jensen, M.C., Rota, J.C., Foord, E.E. (1995) The Gold Quarry mine, Carlin-trend, Eureka County, Nevada. 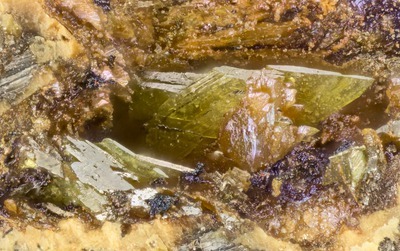 Mineralogical Record, 26(5), 449-469. Castor, S.B., Henry, C.D., Shevenell, L.A. (1996) Volcanic rock-hosted uranium deposits in northwestern Nevada and southeastern Oregon: Possible sites for studies of natural analogues for the potential high-level nuclear waste repository at Yucca Mountain, Nevada. Nevada Bureau of Mines and Geology Open-File Report 96-3, 86 pages. McCormack, J.K. (1996) Large-scale arcuate structures concentric with the McDermitt Caldera Complex: In Coyner, A.R., Fahey, P.L. (Eds.) Geology and Ore Deposits of the American Cordillera. Proceedings of the Symposium (Reno-Sparks, Nevada, April 1995). Geological Society of Nevada, Reno, Nevada. McCormack, J.K. (1997) Mercury sulf-halide minerals and crystalline phases, and experimental formation conditions, in the system Hg3S2Cl2-Hg3S2Br2-Hg3S2I2, Ph.D. thesis, University of Nevada, Reno, Nevada, 154 pages. McCormack, J.K., Dickson, F.W. 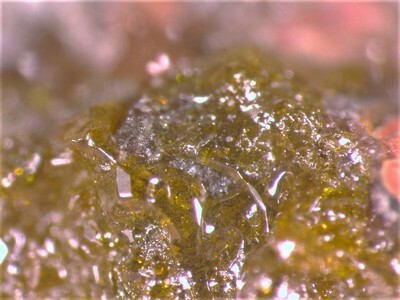 (1998) Kenhsuite, ϒ-Hg3S2Cl2, A new mineral species from the McDermitt Mercury deposit, Humboldt County, Nevada. Canadian Mineralogist, 36, 201-206. 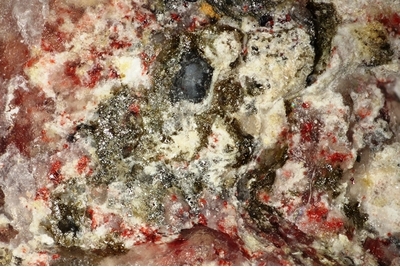 Jambor, J.L., Roberts, A.C. (1999) New Mineral Names, Kenhsuite. American Mineralogist, 84, 194. Castor, S.B., Henry, C.D. (2000) Geology, geochemistry, and origin of volcanic rock-hosted uranium deposits in northwestern Nevada and southeastern Oregon, U.S.A. 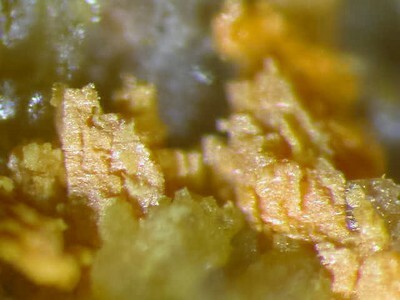 Ore Geology Reviews, 16, 1–40. McCormack, J.K. (2000) The darkening of cinnabar in sunlight. Mineralium Deposita, 35(8), 796-798. Tewalt, N.A., Carrington, R.G. (2001) U.S. gallium exploration report with report on Cordero property for Gold Canyon Resources (unpublished report, 31 pages). Tingley, J.V., LaPointe, D.D. (2002) Metals: In Meeuwig, D. (Ed.) The Nevada Mineral Industry 2001, Nevada Bureau of Mines and Geology, University of Nevada, Reno, Printing Services, Mackay School of Mines, 23, 66 pages. United States Geological Survey (2002) Minerals Yearbook, gallium, Mineral Industry Surveys, Annual Reviews for Minerals Yearbook, 2002, U.S. Government Printing Office, Reston, VA.
Jones, R., Lapp, T., Wallace, D. (2003) Locating and Estimating Air Emissions From Sources of Mercury and Mercury Compounds. EPA Office of Air and Radiation, Report 454-R93023, 303 pages. Rytuba, J.J., John, D.A., Foster, A., Ludington, S.D., Kotlyar, B. (2003) Hydrothermal enrichment of gallium in zones of advanced argillic alteration—examples from the Paradise Peak and McDermitt ore deposits, Nevada: In Bliss, J.D., Moyle, P.R., Long, K.R. (Eds.) Contributions to Industrial-Minerals Research, Chapter C, Bulletin 2209-C, 16 pages. Ainsworth, B. (2004) Geological report for Clan Resources Ltd., Vancouver, BC, Aurora Project, Malheur County, OR, SEC Exhibit 99-1, 34 pages. Castor, S.B.,Ferdock, G.C. 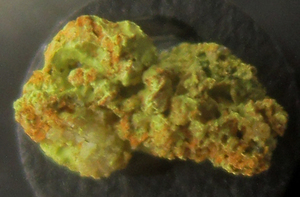 (2004) Minerals of Nevada. Nevada Bureau of Mines and Geology Special Publication Vol. 31, University of Nevada Press, Reno, NV. 512 pages. Dunning, G.E., Hadley, T.A., Magnasco, J., Christy, A.G., Cooper, J.F., Jr. (2005) The Clear Creek mine, San Benito County, California: A unique mercury locality. 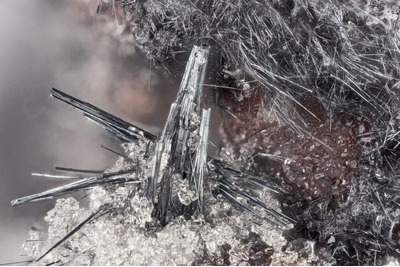 The Mineralogical Record, 36(4), 337-363. Myers, G. (2005) Technical report of the Aurora uranium project, Malheur County, Oregon, prepared for Quincy Energy Corp by Dorado Minerals, Woodinville, WA, 82 pages. Roberts, A.C., Gault, R.A., Paar, W.H., Cooper, M.A., Hawthorne, F.C., Burns, P.C., Cisneros, S., Foord, E.E. 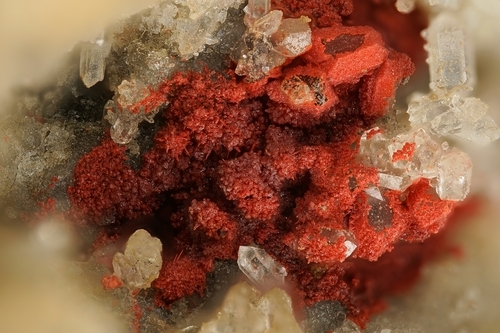 (2005) Terlinguacreekite, Hg2+3O2Cl2, a new mineral species from the Perry pit, Mariposa mine, Terlingua mining district, Brewster County, Texas, USA. Canadian Mineralogist, 43, 1055-1060. Childs, J.F. (2007, August 1) Cordero gold-silver project technical report, Opalite Mining District, McDermitt, Nevada. (Report prepared for Silver Predator Corporation, Reno, Nevada), Cordero-43-101_09-04-07-Final.pdf, 68 pages, 5 plates. 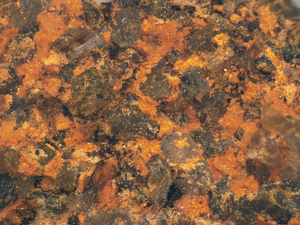 Vinals, J., Calvo, M. (2007) Corderoite, kenhsuite and perroudite, mercury sulfohalides from Chovar, Castello, Spain. Revista de Minerales, 3(3), 46-49. Carew, T.J. (2008) NI 43-101 Technical Report and Resource Estimation for the Cordero Gallium Project, Humboldt County, Nevada, USA (prepared for Gold Canyon Resources, Inc.), 35 pages. Coble, M.A., Mahood, G.A. (2008) New geologic evidence for additional 16.5-15.5 Ma silicic calderas in northwest Nevada related to initial impingement of the Yellowstone hot spot. IOP Publishing, Inc., Collapse Calderas Workshop, Conference 1, Volume 3, Earth and Environmental Science, 4 pages. Pierce, K.L., Morgan, L.A. (2009) Is the track of the Yellowstone hotspot driven by a deep mantle plume?—review of volcanism, faulting, and uplift in light of new data. Journal of Volcanology and Geothermal Research, 188, 1–25. Stetson, S.J., Gray, J.E., Wanty, R.B., Macalady, D.L. (2009) Isotopic variability of mercury in ore, mine-waste calcine, and leachates of mine-waste calcine from areas mined for mercury. Environmental Science & Technology, 43(19), 7331-7336. United States Geological Survey (2010) Minerals Yearbook, lithium, Mineral Industry Surveys, Annual Reviews for Minerals Yearbook, 2010, U.S. Government Printing Office, Reston, VA.
Causey, J. D. (2011) Mining Claim Activity on Federal Land in the United States. United States Geological Survey, Data Series 290, Version 4.0, 31 pages and data files. Castor, S.B., Ferdock, G.C. 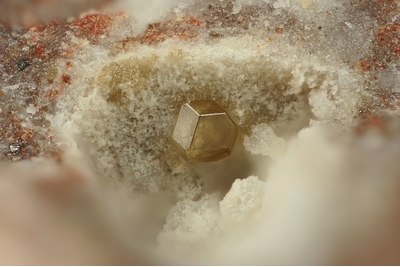 (2012) Minerals of Nevada. Nevada Bureau of Mines and Geology Special Publication 31, 560 pages. Coble, M.A., Mahood, G.A. (2012) Initial impingement of the Yellowstone plume located by widespread silicic volcanism contemporaneous with Columbia River flood basalts. Geology, 40(7), 655-658. Marvin-DiPasquale, M., Alpers, C.N., Dunkelman, T., Bauer, R., Ellis, D.N., Slowey, A.J. (2012) Mercury bioaccessibility associated with calcine waste in McDermitt, Nevada: In conference proceedings of Hardrock Mining 2012, Advancing Solutions for a New Legacy, sponsored by the U.S. EPA, April 3-5, 2012, Renaissance Denver Hotel, Denver, CO, pp. 105-106. Henry, C.D., Castor, S.B., Starkel, W.A., Ellis, B.S., Wolff, J.A., Heizler, M.T., McIntosh, W.C. (2012) Geologic mapping, volcanology, mineralization, and high precision 40Ar / 39Ar dating of early Yellowstone hotspot magmatism. Abstract V33B-2850 presented at 2012 Fall Meeting, AGU, San Francisco, Calif., 3-7 Dec.
Benson, T.R., Mahood, G.A., Coble, M.A. (2013) An intense 16.5-16.0 Ma episode of rhyolitic volcanism associated with flood basalt dike emplacement at McDermitt Caldera Field and High Rock Caldera Complex, Nevada and Oregon. American Geophysical Union Fall Meeting, Dec., abstract V33E-2828. Henry, C.D., John, D.A. (2013) Magmatism, ash-flow tuffs, and calderas of the ignimbrite flareup in the western Nevada volcanic field, Great Basin, USA. Geosphere, 9, 951–1008. Luckett, M., Mahood, G.A., Benson, T.R. (2013) Earliest Silicic Volcanism Associated with Mid-Miocene Flood Basalts: Tuffs Interbedded with Steens Basalt, Nevada and Oregon. American Geophysical Union, Fall Meeting, Dec., Abstract V33E-2829, 1 page. Blumefeld, J. (2014) Environmental photo selection of McDermitt and Cordero mine areas. www.flickr.com/photos/epar9jeb. Starkel, W.A. (2014) Mapping, geologic evolution and petrogenesis of the McDermitt volcanic center, northern Nevada and southern Oregon, USA. Ph.D. thesis, Washington State University, School of the Environment, 407 pages. Benson, T.R., Mahood, G.A., Coble, M.A. 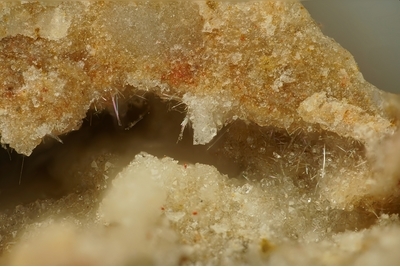 (2014) Magmatic enrichments of energy-critical elements Li, Ga, and REE in rhyolites of McDermitt Volcanic Field, High Rock Caldera Complex, and Buff Peak identified by in situ SHRIMP-RG analysis of melt inclusions in quartz. Paper 343-12, October. Geological Society of America Abstracts with Programs, 46(6), 826. Benson, T.R., Mahood, G.A., Coble, M.A. (2015) Controls on the enrichment of energy-critical elements (Li, Ga, REE) in weakly peralkaline magmas of the Mid-Miocene McDermitt Volcanic Field, Oregon and Nevada, based on in situ SHRIMP-RG analyses of quartz-hosted melt inclusions. GSA Annual Meeting, Baltimore, November. Benson, T.R., Mahood, G.A. (2015) The Oldest Known Caldera Associated with the Yellowstone Hotspot: New Geologic Mapping, Geochemistry, and 40Ar/39Ar Geochronology for the Northern McDermitt Volcanic Field, Northern Nevada and Southeastern Oregon. American Geophysical Union Fall Meeting, December. Benson, T.R., Mahood, G.A., Coble, M.A., Grove, M.J. (2016) New geological mapping and 40Ar/39Ar geochronology demonstrate that rhyolite volcanism mirrors northward propagation of Mid-Miocene Columbia River Flood Basalts. GSA Rocky Mountain Section Meeting, Moscow, Idaho, May. Benson, T.R., Mahood, G.A. (2016) A tale of two swarms: mapping of calderas and 40Ar/39Ar geochronology delineate two distinct Steens Basalt fissure systems. American Geophysical Union Fall Meeting, December. Carew, T.J., Rossi, M.E. (2016) June, Independent Technical Report for the Lithium Nevada Project, Nevada, USA, prepared for Lithium Americas, Inc. by SRK Consulting, Vancouver, British Columbia, Canada, 132 pages. Coble, M.A., Mahood, G.A. (2016) Geology of the High Rock caldera complex, northwest Nevada, and implications for intense rhyolitic volcanism associated with flood basalt magmatism and the initiation of the Snake River Plain-Yellowstone trend. Geosphere, 12(1), 58-113. Henry, Christopher D., Castor, Steven B., Starkel, William A., Ellis, Ben S., Wolff, John A., McIntosh, William C., Heizler, Matthew T. (2016) Preliminary geologic map of the McDermitt caldera, Humboldt County, Nevada and Harney and Malheur counties, Oregon. Nevada Bureau of Mines and Geology Open-File Report 16-1, 1 plate, 8 pages. Mahood, G.A., Benson, T.R. (2016) 40Ar/39Ar ages on intercalated silicic tuffs provide precise ages for Steens Basalt lavas: implications for flood basalt effusion rates, relation to Miocene Climatic Optimum, and the age of the Steens Geomagnetic Reversal. GSA Rocky Mountain Section Meeting, Moscow, Idaho, May. Muntean, J.L., Davis, D.A., Shevenell, L. (2016) The Nevada Mineral Industry 2014. Nevada Bureau of Mines and Geology Special Publication MI-2014, 173 pages. United States Geological Survey (2016) Minerals Yearbook, mercury, Mineral Industry Surveys, Annual Reviews for Minerals Yearbook, 2014, U.S. Government Printing Office, Reston, VA.
Vikre, P.G., et al. (2016) Geology and mineral resources of the Sheldon-Hart Mountain National Wildlife Refuge Complex (Oregon and Nevada), the Southeastern Oregon and North-Central Nevada, and the Southern Idaho and Northern Nevada (and Utah) Sagebrush Focal Areas: Chapter B in Mineral resources of the Sagebrush Focal Areas of Idaho, Montana, Nevada, Oregon, Utah, and Wyoming (ver. 1.1, October 28, 2016): U.S. Geological Survey Scientific Investigations Report 2016–5089–B, 224 pages. Benson, T.R. (2017) Geology, 40Ar/39Ar geochronology, and lithium enrichment of the mid-Miocene McDermitt Volcanic Field (Nevada and Oregon, United States). Ph.D. Thesis, Stanford University, 239 pages. Benson, T.R., Coble, M.A., Rytuba, J.J., Mahood, G.A. (2017) Lithium enrichment in rhyolite magmas of intracontinental calderas leads to Li deposits in caldera basins. Nature Communications, 8, article 270, 1-9. Coyan, J.A., Zientek, M.L., Mihalasky, M. J. (2017) Spatiotemporal Analysis of Changes in Lode Mining Claims Around the McDermitt Caldera, Northern Nevada and Southern Oregon. Natural Resources Research, 26(3, July), 319-337. Mahood, G.A., Benson, T.R. (2017) Using 40Ar/39Ar ages of intercalated silicic tuffs to date flood basalts: Precise ages for Steens Basalt Member of the Columbia River Basalt Group. Earth and Planetary Science Letters, 459, 340-351. Henry, C.D., Castor, S.B, Starkel, W.B., Ellis, B.S., Wolff, J.A., Lavarie, J.A., McIntosh, W.C., Heizler, M.T. (2017) Geology and evolution of the McDermitt caldera, northern Nevada and southeastern Oregon, western USA. Geosphere, 13(4, July), 1066-1112. Fourie, L., Peldiak, D. (2018) Independent Technical Report for the Thacker Pass Project, Humboldt County, Nevada, USA (prepared for Lithium Nevada Corp., a wholly owned subsidiary of Lithium Americas Corp. (“LAC”) by Advisian Americas (“Advisian”), a division of the WorleyParsons Group, February 15, 2018), 95 pages. Ehansi, E., Fourie, L., Hutson, A., Peldiak, D., Spiering, R., Young, J., Armstrong, K. (2018) Technical Report on the PreFeasibility Study for the Thacker Pass Project, Humboldt County, Nevada, USA (prepared for Lithium Nevada Corp., a wholly owned subsidiary of Lithium Americas Corp. (“LAC”) by Advisian Americas (“Advisian”), a division of the WorleyParsons Group, August 1, 2018), 266 pages. Placer Amex, Inc., McDermitt Mine (Date Ukn. ), a corporate brochure, 8 pages. http://www.westernlithium.com/lithium-project/reports/ Western Lithium NI43-101 (2014).